I started a new book this morning. The author is Verlyn Klinkenborg. I'd just finished his book A Rural Life and it blew me away. He's a columnist for the New York Times and he writes about rural life on his farm. Each day when I sit down at the keyboard, I try to find fresh ways of describing unexceptional things. It's not easy and I often miss the mark. But sometimes when the word gods smile upon me, I get close. Often, I try to say too much in my sentences. This sometimes makes the meaning unclear. The book I just started is entitled A Few Short Sentences About Writing "puts the hay down where the goats can get at it" to use a tired old saying. Jilda recently finished the book and she said it changed her approach to writing. It's too early for me to make that claim. I will give a report once I finish. I hope this Saturday has been kind to you. For me, trying to write without a good vocabulary and less knowledge of the English language is a big handicap. Sherry ws the first to tell me I run my sentences too long. I wish that were my only problem lol.. I always enjoy my visit here and wish I could be as concise. Now you've got my curiosity peaked. I'll have to take a look at A Rural Life. Thanks for the tip! This post seemed to be extra well written! I look forward to hearing more about this book and its affect on your writing. I like a book that gives description so I can see with my mind's eyes without over doing it. I want to get to the hay, so to speak right away. I hope that you can get something out of this book that will help you be the better writer that you want to be. Finding a good book that inspires you is like finding pieces of gold. I love to read and always on the outlook for a new book to read. 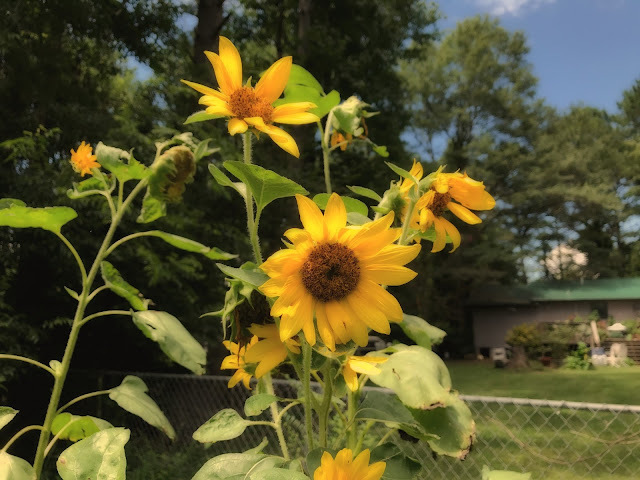 Love the sunflowers you've pictured today ! They are an inspiration in themselves. I love your style of writing; it's SO homey!! Don't change too much. You're a natural. It is good to keep working at your craft. I like your writing but I guess it's always good to see different points of view. Beautiful sunflowers! I always say I'll plant some and then forget every year!